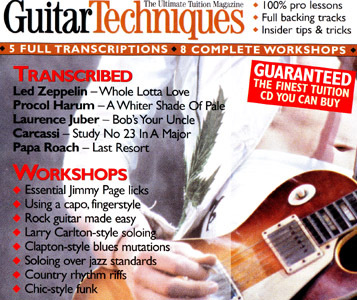 BtP readers may be interested to know how the final written 'mix' of a magazine piece like this comes about: so we've varied the text colour in order to show who did what: in green, text by the editorial team at Guitar Techniques; in grey, text submitted by the author but not used by Guitar Techniques. It may be interesting to remember – when responding to apparent authorial nuance – that virtually everything you read in print will be an amalgam, whether collaborative or not, between originator and editor. Hear A Whiter Shade of Pale on Procol Harum's live album, One More Time [sic]. Procol Harum's haunting classic, A Whiter Shade of Pale, was one of the stand-out hits of 1967: to this day, audiences around the world remain enchanted by the contrast between composer Gary Brooker's passionate, bluesy vocal and the tightly-organised, churchy background, of which Matthew Fisher's artful Hammond counterpoint is an integral feature. 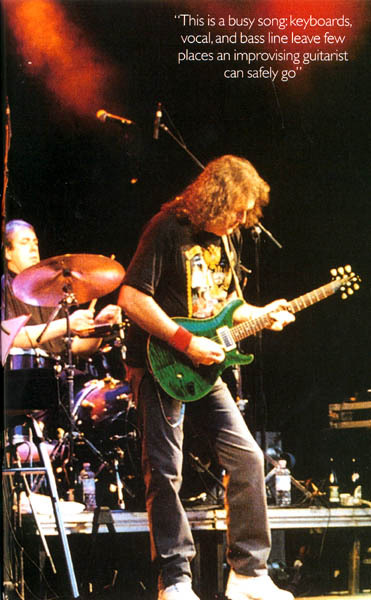 Uncharacteristically for Procol – whose first five albums featured Robin Trower – this song originally featured (uses) barely any guitar; though that obviously changed when Geoff Whitehorn joined the band 10 years ago. Hundreds of bands have covered it, but few have managed to find a convincing role for the guitarist without disrupting the organ line, and hence the balance of the whole composition. 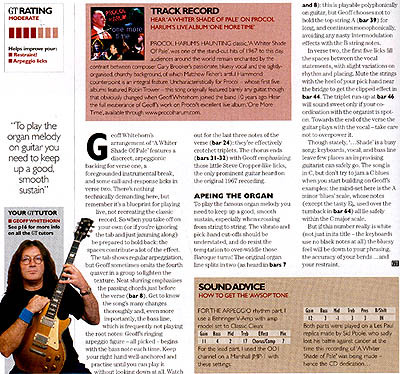 Geoff Whitehorn has been Procol Harum's guitarist since 1991, and this month's track presents the current stage version of their famous anthem, his guitar part a study in restraint. You can hear the full exuberance of Geoff's work on Procol's excellent live album, One More Time, available through www.procolharum.com; watch out for the band's European gigs later in the year. Geoff Whitehorn's Whiter Shade features a discreet, arpeggionic backing for verse one, a foregrounded instrumental break, and some call-and-response licks in verse two. There's nothing technically demanding here, but remember it's a blueprint for playing live, not recreating the classic record. So when you take off on your own (or if you're ignoring the tab and just jamming along) be prepared to hold back, and study what Geoff's not doing: the spaces contribute a lot of the effect. The tab shows very regular arpeggiation, but Geoff sometimes omits the fourth quaver in a group so as to lighten the texture. Neat slurring emphasises the passing-chords just before the verse [bar 8]. Get to know the song's many changes thoroughly, and even more importantly the bassline, which is frequently not playing the root-notes: Geoff's ringing arpeggio figure – all picked – begins with the bass note each time. Keep your right hand well-anchored, and practise until you can play without looking down at all – so you can concentrate on grinning at the lighter-waving mob! Watch out for the last three notes of the verse [bar 24]: they're effectively crotchet triplets. The chorus ends [bars 31–32] with Geoff emphasising those little Steve Cropper-like licks, the only prominent guitar heard on the 1967 recording. To play the famous organ melody (lazy critics spread the idea that this was plagiarised from JS Bach – it wasn't!) you need to keep up a good smooth sustain, especially when crossing from string to string. The vibrato and pick-hand cut-offs should be understated, and do resist the temptation to over-widdle those Baroque turns [bars 38 and 39]: CPE Bach (in 1753) wrote of embellishments as 'spices – which may ruin the best dish'! 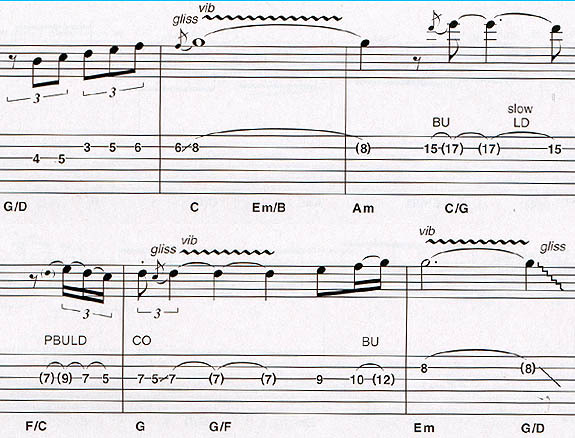 The original organ line splits in two [as heard in bars 7 and 8]: this is playable polyphonically on guitar, but Geoff chooses not to hold the top string 'A' [bar 39] for long, and he continues monophonically, avoiding undesirable intermodulation effects with the B string notes. In verse two, the first five licks fill the spaces between the vocal statements (Geoff tastefully varies their) with slight variations on rhythm and placing. Mute the strings with the heel of your pick-hand near the bridge to get the clipped effect in bar 44. The triplet run-up at bar 46 will sound sweet only if your co-ordination with the organist is spot-on. Towards the end of the verse the guitar plays with the vocal: take care not to overpower it. Though stately, Shade is a busy song: keyboards, vocal, and bassline leave few places an improvising guitarist can safely go. The song is in C, but don't try to jam a C blues when you start building on Geoff's examples: the mind-set here is the A minor 'blues' scale, whose notes (except the tasty E flat, used over the turnback in bar 64) all lie safely within the C major scale. That said, it was Trower's pentatonic soloing over a diatonic framework that gave the early Procol much of its earthy character: many bands who copied their classical leanings tended to play too safe and 'white'. But if this number really is white (not just in its title – the keyboards use no black notes at all): the bluesy feel will be down to your phrasing, the accuracy of your bends … and your restraint. For the arpeggio backing part find a clean, chorused sound with plenty of treble: you'll probably want both pickups for this. For the overdriven lead parts, switch to bridge pickup only, and turn up the gain: a bit of presence helps a great deal, but take care not to overdo the distortion, or you won't hear the natural tone of your instrument and your playing will lack light and shade. Since modesty forbids Geoff from blowing his own trumpet, the commentary was written by PH-expert Roland Clare, joint-editor of the website 'Beyond the Pale' (www.procolharum.com). Roland also runs the Palers' Band, who occasionally convene to play Procol music, for fun, on the fringes of the real band's most prestigious gigs.